WILDE GATHERINGS provides a holistic range of products with Ayurvedic principles. By holistic we mean: products that use natural, raw and organic herbal ingredients; products that are responsive to what your skins needs, as it needs it; and products that are free from fillers, emulsifiers and chemicals that are disruptive to your skin and to the environment. Our system allows you to use natural ingredients that can be mixed, matched, massaged or masked, that respond to what your skin needs—that season, month or even that week. Products that allow you to give your skin what it is asking for, once you learn how to listen. Listen to your skin: Find your balance. Transform your skin with this magical cleanser. Moisturizing Aloe Vera Oil, Olive Oil and Seabuckthorn Oil work together with Lemon, Orange and Neroli to brighten and invigorate. Super hydrating and anti-oxidant rich Seabuckthorn and Borage Seed Oil work to promote skin cell renewal and repair environmental damage. Jasmine and Lemon essential oils give life to lackluster skin. 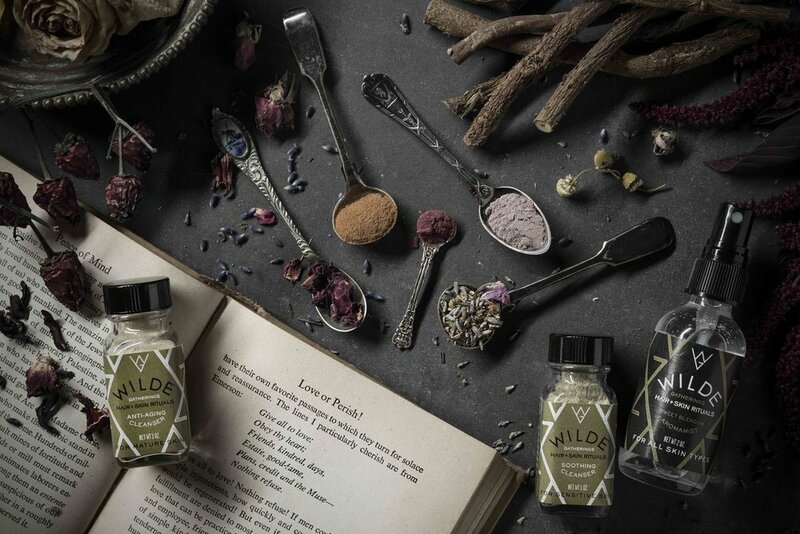 All Wilde Gatherings products are created based on Ayurvedic principles. Ayurveda is a 5,000 year old Hindu practice which translates as the science of life (Ayur=life, Veda=science or knowledge). This practice focuses on finding balance and recognizing the relationship among body, mind and spirit. Central to this practice is increasing awareness, enabling the individual to notice and respond when their body is out of balance. The practice then offers interventions using diet, herbs, aromatherapy, massage and meditation to reestablish harmony. Wilde Gatherings focuses on the skin, but our hope is that it introduces the concepts of awareness and starts you down a path toward wellness. Your skin will often tell you when life, the environment, hormonal changes, seasonal changes or even diet creates imbalance. However, even if you have good skin turning your awareness toward treating your skin mindfully and using natural and organic products can make good skin great and troubled skin healthy again. 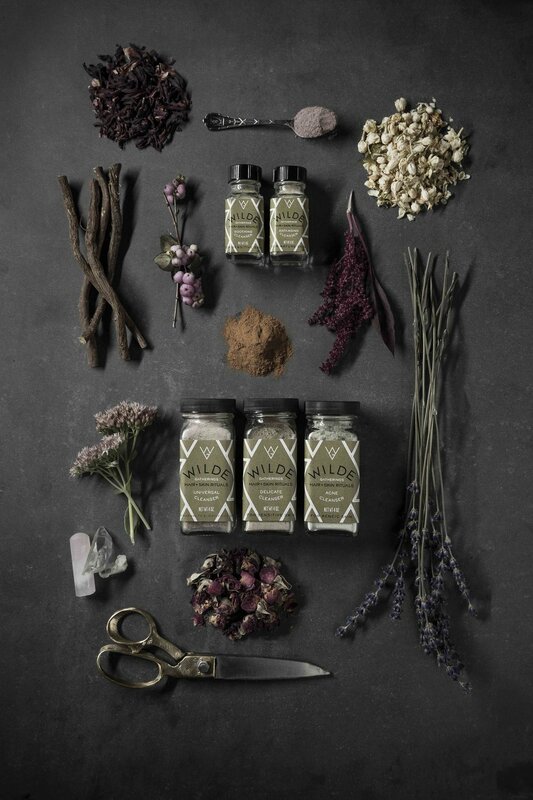 Our mission at Wilde Botanicals is to provide a holistic range of products based on Ayurvedic principles. By holistic we mean: products that use natural, raw and organic herbal ingredients; products that are responsive to what your skins needs, as it needs it; and products that are free from fillers, emulsifiers and chemicals that are disruptive to your skin and to the environment. Our system, allows you use natural ingredients that can be mixed, matched, massaged or masked, that respond to what your skin needs—that season, month or even that week. Products that allow you to give your skin what it is asking for, once you learn how to listen. Our goal is to help your skin reach balance. Wilde products are designed to empower you to respond to your skins needs. Our passion is helping you to learn how to listen to the needs of your skin by sharing the wisdom and formulas of this 5000 year old practice. Like good health, good skin comes from an awareness of the effects of what we put into it. Are your pores clogged or congested? Massage your face with our cleanser a bit longer, the botanicals will further break down and deliver even more of their detoxifying properties. Is your skin feeling a bit parched? Bring our moisture mist to work with you for a mid-day moisture refresh. Too often, we ignore this signs that we are out of balance; we don’t commit to getting more sleep when we are feeling run down, we eat foods that make us feel sluggish and tired, and we apply harsh chemicals to our entire face when we have a single blemish. Our product line is designed to allow you to customize the response to your skins needs in the moment. Creating natural and organic products that work together to maximize benefits and tailor effects; we provide here and now solutions for your skins changing needs, giving you the tools to respond and to promote lasting balance. We do not use a generic response to skin care, because being responsive and adaptive is part of taking care of skin your skin, your body and your spirit. Hey there! Thanks for visiting our shop! Do you have any questions regarding our products or usage? Just want to drop us a line and say hi? Fill out the form below and we'll respond ASAP. Looking forward to hearing from you. Thank you! Add your phone number if you would like a call on product usage and care!